Competition in Data Visualization market is not only on features, market share and mindshare but also on pricing and lisensing. For example the Qlikview licensing and pricing is public for a while here: http://www.qlikview.com/us/explore/pricing and Spotfire Silver pricing public for a while too: https://silverspotfire.tibco.com/us/silver-spotfire-version-comparison . The release of Tableau Server online hosting this month: http://www.tableausoftware.com/about/press-releases/2013/tableau-unveils-cloud-business-intelligence-product-tableau-online heated the licensing competition and may force the large changes in licencing landscape for Data Visualization vendors. Tableau Server existed in the cloud for a while with tremendous success as Tableau Public (free) and Tableau Public Premium (former Tableau Digital with its weird pricing based on “impressions”). But Tableau Online is much more disruptive for BI market: for $500/year you can get the complete Tableau Server site (administered by you!) in the cloud with (initially) 25 (it can grow) authenticated by you users and 100GB of cloud storage for your visualizations, which is 200 times more then you can get for $4500/year top-of-the line Spotfire Silver “Analyst account”. This Tableau Server site will be managed in the cloud by Tableau Software own experts and require nor IT personnel from your side! You may also compare it with http://www.rosslynanalytics.com/rapid-analytics-platform/applications/qlikview-ondemand . A hosted by Tableau Software solution is particularly useful when sharing dashboards with customers and partners because the solution is secure but outside a company’s firewall. In the case of Tableau Online users can publish interactive dashboards to the web and share them with clients or partners without granting behind-the-firewall access. Since Tableau 8 has new Data Extract API, you can do all data refreshes behind your own firewall and republish your TDE files in the cloud anytime (even automatically, on demand or on schedule) you need. 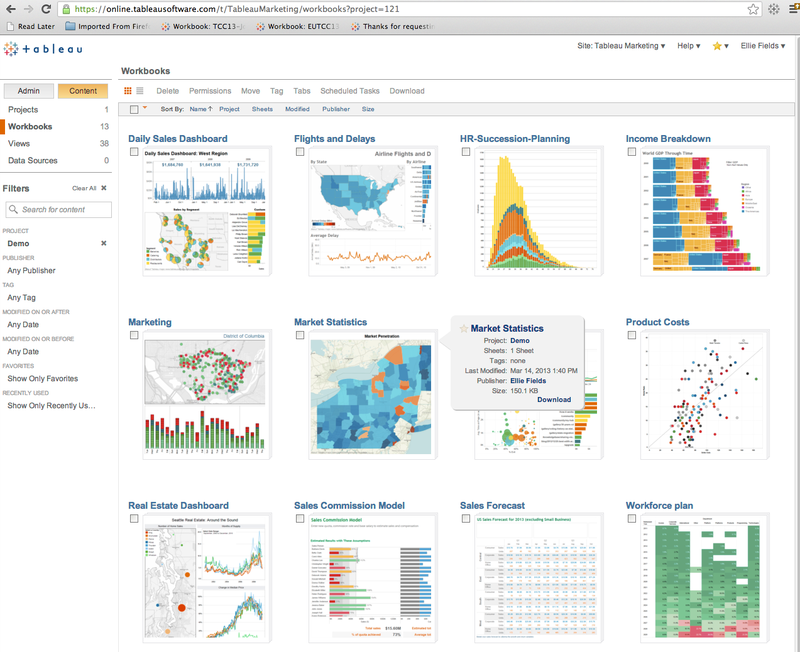 Tableau Online has no minimum number of users and can scale as a company grows. At any point, a company can migrate to Tableau Server to manage it in-house. 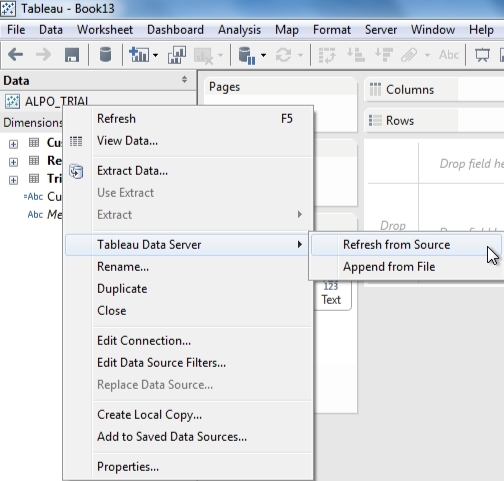 Here is some introductionla video about Tableau Online: Get started with Tableau Online. Tableau as a Service is a step in right direction, but be cautious: in practice, the architecture of the hosted version could impact performance. Plus, the nature of the product means that Tableau isn’t really able to offer features like pay-as-you-go that have made cloud-based software popular with workers. By their nature, data visualization products require access to data. For businesses that store their data internally, they must publish their data to Tableau’s servers. That can be a problem for businesses that have large amounts of data or that are prevented from shifting their data off premises for legal or security reasons. It could also create a synchronization nightmare, as workers play with data hosted at Tableau that may not be as up-to-date as internally stored data. Depending on the location of the customer relative to Tableau’s data center, data access could be slow. And finally, the online version requires the desktop client, which costs $2,000. Tableau may implement Tableau desktop analytical features in a browser in the future while continue to support the desktop and on-premise model to meet security and regulations facing some customers. Hosted on AWS gives confidence in uptime and speed. And it says it supports live connections, so you don’t have to worry about updates or keeping row counts below 1 Million.